High quality universal car battery terminal clamps. Great conductive performance,corrosion resistance,can reduce the voltage distortion and the current transmission loss. Suitable for most car,vehicles,boat, van battery. High quality universal car truck battery terminal clamp set,includes positive 1pcs and negative 1pcs. Corrosion resistance:can reduce the voltage distortion and the current transmission loss. Allen set silver plating screws hold wire securely and tightly;Up to 4 cables can be firmly and neatly secured in the battery terminal at the same time. Suitable for advanced audio technology, heavy-load lighting, heavy-duty and commercial use. 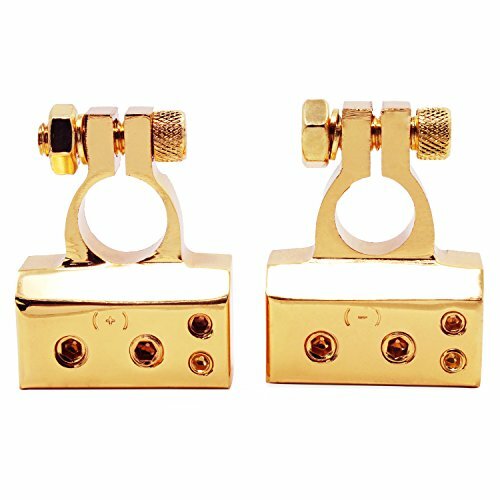 Package Content: 2Pcs x car battery terminal clamps; Positive and negative terminals accept one 2 gauge, one 4 gauge, and two 8 gauge connections. View More In Battery Wiring & Terminals. If you have any questions about this product by OCR, contact us by completing and submitting the form below. If you are looking for a specif part number, please include it with your message.